Personally, I’ve never been one to get up in the middle of a good snooze and get a snack. I’ve also never fallen asleep in my food. I’ve also never eaten my lovey. No, wait. That’s a cereal bear…I mean a cereal BAR, right? Well, anyone who ever played Oregon Trail knows you have to eat your pets enroute sometimes. At least he fell asleep before he got too far into his meal. If I were that bear, though, I’d make a run for it at the next rest stop. The kids…they are crazy for Minecraft! Apparently, after wandering the countryside, touchily exploding on folks, these Creeper things need a break, too. It’s not easy being green. 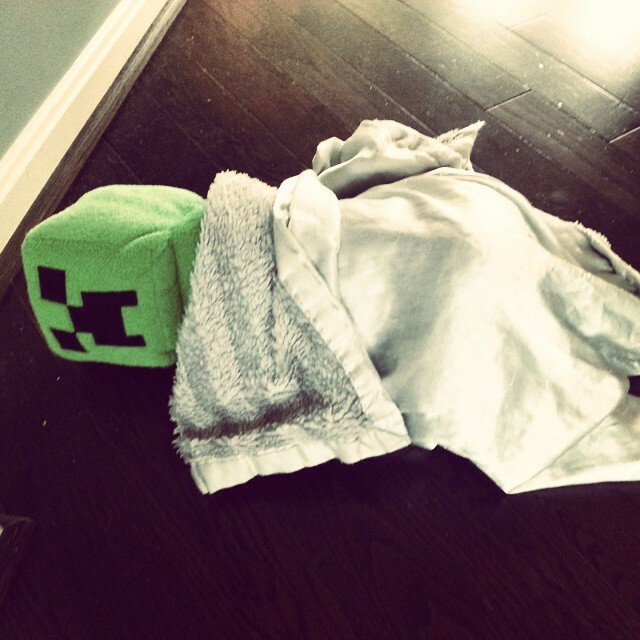 My youngest appears to have tucked his Creeper in for a little nap, using his baby blanket. I mean, Creepers are probably misunderstood. Who knows why they explode like they do? They probably have some serious baggage to relate, if you would just give them a chance to explain themselves. Maybe this one will reveal his motivations after he has a little snooze. Better mood and all. Our heartfelt thanks to all the men and women who serve. You deserve a break. That’s me! 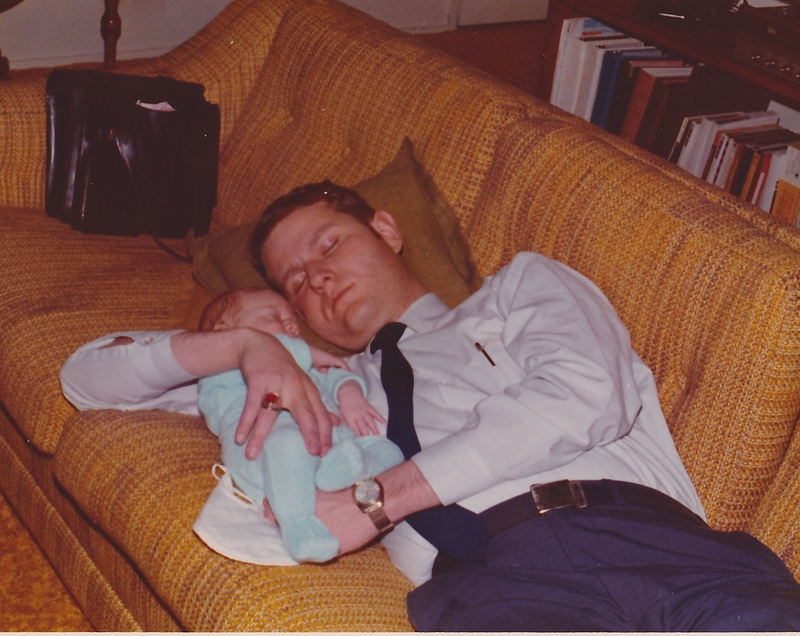 The little one…about 1973…and one really tired serviceman. Don’t you hate it how your kids never behave for you, and then they’re just perfect angels for NANA? 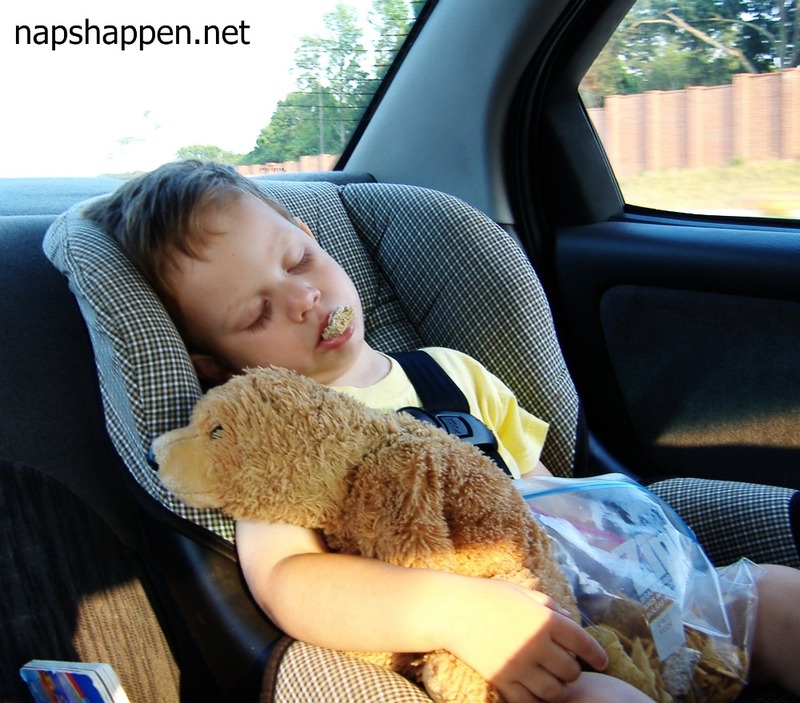 Because we all know children are sweetest when they’re asleep. 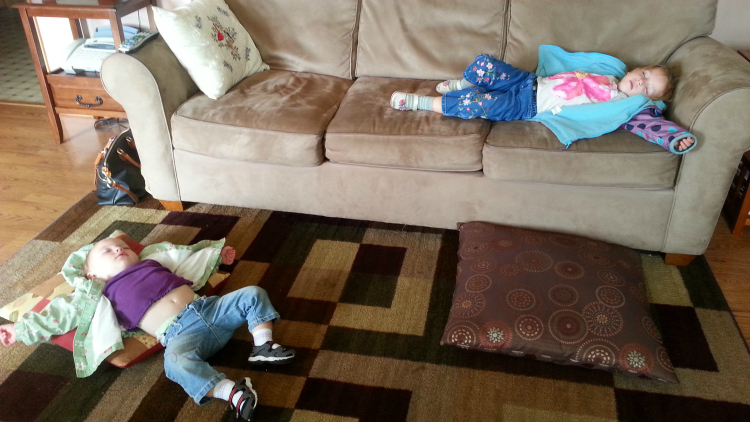 Jeannette from Mommy Needs a Martini sent me this infuriating photo of her children, who seem to have walked through their Nana’s door and instantly and compliantly started to nap. Paying homage to My Cousin Vinny, I’d say “The two yutes, OH EXCUSE ME…the TWO YOUTHS” are guilty only of being present at the scene of this napping crime. It’s all about the positraction, right? In this case, one wheel stayed on the ground and the other rode up on the couch. Still, they nap in perfect synchronicity. And Nana thinks they’re easy to get to sleep. Wouldn’t you know? You’ll never hear the end of it.